A more than twenty-five fold jump in investment in fewer than 10 years. That's how fast China is gaining control over Africa’s mining industry. And Beijing's push is not ending any time soon. China’s growing economy is thirsty for sustainable supplies of mineral resources. Despite being the number one mining nation in the world, China is facing a rapid depletion of its local mineral resources. 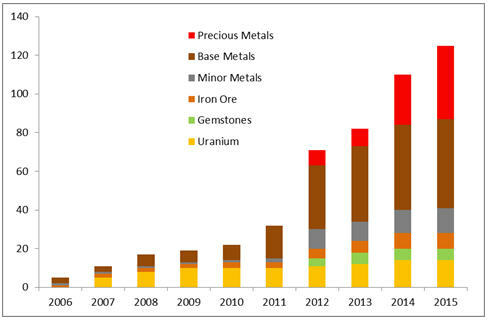 Reserves-to-production (R/P) ratio that represents the “burn rate” of proven reserves of mineral commodities when applying current levels of domestic mine production shows that China is in the “red zone” for future supplies of nearly all crucial minerals (Figure 1). Figure 1. R/P (“burn rate”) ratio for China in comparison to world average R/P, years. Sources: compilation of USGS, BP, country and other reports. The scale of China’s expansion in Africa is just a mind blowing. In less than 10 years since Chinese authorities called for mineral resources diversification globally, the number of major mining/mineral processing assets in Africa with China-headquartered companies interest, increased from only a handful in 2006 to more than one hundred and twenty in 2015 (Figure 2). And those are only assets in advanced stages of their development, i.e. the figures exclude early exploration and other greenfield projects. Figure 2. 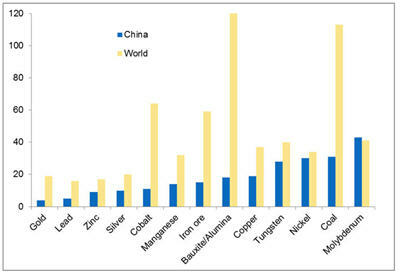 Evolution of major mining/mineral processing assets in Africa with China-based companies’ interest, cumulative numbers. Source: IntelligenceMine. Keeping in mind that many of China-Africa deals are not always made public, an adjusted number of China-controlled mining assets in Africa could be even more impressive. From the regional point of view, Chinese companies became firmly anchored to the Southern African countries and now quickly spreading to the north from Equator (Figure 3). Figure 3. 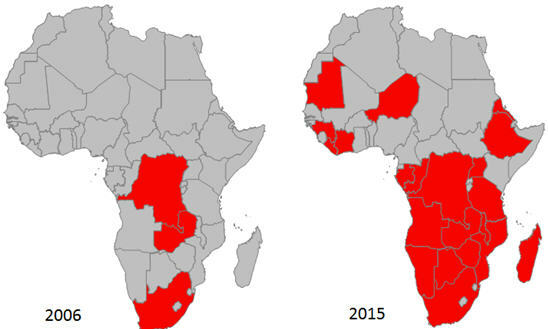 Countries in Africa, where mining interest of China-based companies exists, evolution from 2006 to 2015. A wide variety of corporate entities have contributed to this formidable expansion, including mining, mineral processing, metallurgical, manufacturing, power generation, infrastructure development companies, as well as investment banks, research institutes and even individuals. The forms of mining deals that China employs in Africa are also very diverse and involve direct investments in mining projects, infrastructure investments–to-mineral resources “trade-in” deals, joint ventures, indirect investments, off-take agreements, options and a variety of other structures. 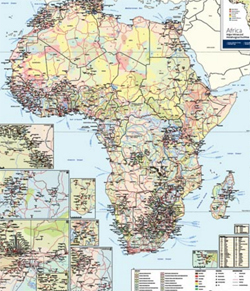 IntelligenceMine's new 2015 Africa Mining Map shows the locations of 650 producing mines and development projects, nearly 150 metallurgical facilities, major roads, railroads, ports and shipping distances and regional geology. These examples give some insight into the vast scope of China’s involvement in Africa’s resources and mining industry. In 2012, China General Nuclear Power Corporation (CGNPC) acquired Husab project in Namibia (Figure 4), which is one of the biggest uranium deposits in the world, and now is finishing construction of a huge uranium mine there. 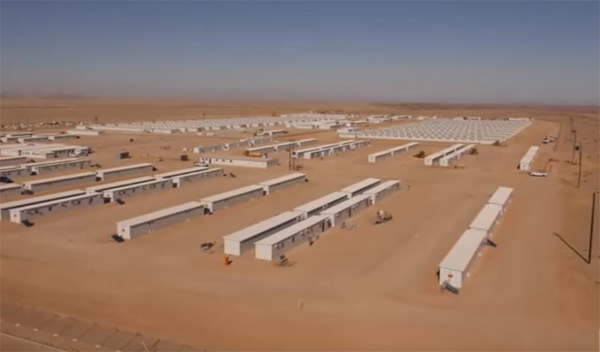 In under three years since earthmoving activities first began at Husab, CGNPC built and is now commissioning the world's third largest uranium mine. Another notable project is a massive Kamoa copper deposit located in the Democratic Republic of Congo (DRC), which is recognized as the world’s biggest undeveloped high-grade copper deposit. Zijin Mining Group recently completed a half a billion dollars deal with Ivanhoe Mines that allows Zijin to control this advanced project. No doubt Zijin, which is not lacking of governmental funds and in-house mining expertise, is going to commission this mine as soon as possible. Figure 4. 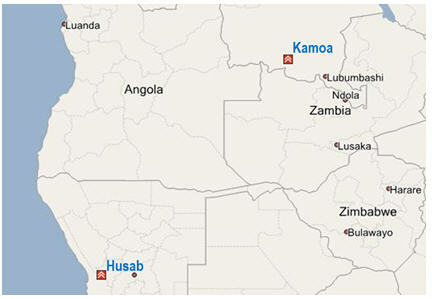 Husab and Kamoa projects location. Source: IntelligenceMine online mapper. There are a many more world-class mining assets located in Africa acquired by Chinese companies in recent years. Why has Africa became a priority destination for China? First and foremost, it's the continent's rich endowment of mineral resources with many world-class deposits discovered in recent years. Secondly its untapped mineral resources provides excellent greenfield development potential. South Africa produces 52% of world’s chromium, is the world leader in production of manganese and platinum group metals, controlling about 95% of global PGM reserves. It is also the biggest producer of ilmenite, second biggest producer of vanadium and in Top-5 of global rutile and zirconium producers. South Africa is also a renowned producer of gold and controls world’s largest in-situ gold reserves. Democratic Republic of the Congo (DRC) produces approximately 50% of global cobalt and hosts about half of global reserves. DRC is also in top-5 producers of copper, diamond and tantalum (second place). Botswana is the global leader in diamond production by value and in top-5 of other gemstones’ producers. Guinea is in top-5 of biggest bauxite producers, being the world leader in bauxite reserves. Zimbabwe is the fifth biggest producer of lithium and in top-5 of world’s largest PGM producers. Morocco is the second biggest producer of phosphates and controls 75% of global phosphate reserves. Mozambique is in the top-5 global producers of tantalum, ilmenite and zirconium. Rwanda is the leader in production of tantalum. Western companies have tended to be more cautious about investing on the continent which is still grappling with serious infrastructure deficiencies, political turmoil, weak institutions and corruption. Chinese companies have shown greater tolerance for risk and have proven to be adept at navigating political and economic upheaval. Not least because the country's mining majors enjoy the firm backing of the government in Beijing and the country is able to take a long term strategic view. In recent years, African countries increased output of nearly all major mineral commodities (except PGMs) as this table shows. With the backing of China, do not expect the pace of development to slow any time soon.